We work to continuously make sure the people we serve receive the highest possible quality care, when they need it. Use these resources to stay up to date on all things PI. Chronic disease management: Blood Pressure Control in Hypertensive Clients. By December 2019, 65% of Hypertensive Clients will have adequately controlled blood pressure (<140/90mmHg) at their most recent medical visit. Preventive care: Weight Screening and Counseling. By December 2019, 75% of adults and 70% of children will have a documented BMI, counseling and/or follow-up plan. Behavioral health: Depression Remission. By December 2019, 10% of adults diagnosed with major depression or dysthymia who scored positively on an initial PHQ-9 (>9) will demonstrate remission at 6 months (PHQ <5). Infectious Disease: Flu Immunization. By March 31, 2019, 45% of eligible clients will have documentation of flu vaccine administration. Oral Health: Pediatric Dental Varnish. By December 2019, 50% of eligible pediatric clients will have received fluoride varnish applications. 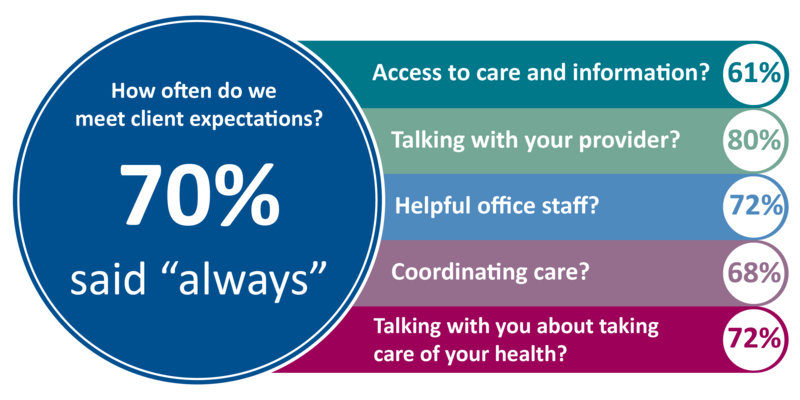 Provider Communication: By December 2019, 83% of clients will respond “always” on Client Experience Survey questions relating to good provider communication. Incident Reporting: By December 2019, the proportion of incident reports in the following categories: near misses, treatment/diagnostic/procedure related, or medication errors will increase to 25% of all reported incidents. Missed Appointments: By December 2019, the organization will have a missed appointment rate at or below 20%. Our clients' perspectives help us shape our goals. Before he could get his late-stage cancer treated, David’s oncologist told him that his mouth had to be cleared of all infection. Parita Patel, our Dental Director, did what she could. She conducted an exam and pulled many of his infected teeth. But David needed oral surgery with sedation to safely remove all the damaged teeth.